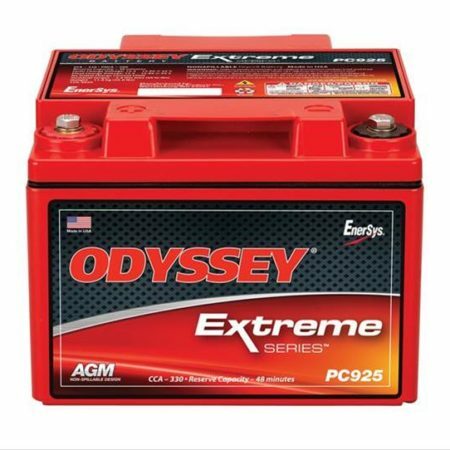 Odyssey PC545MJ Drycell Battery The Odyssey PC545MJ is a 12 volt 545CA/185CCA 14 Ah drycell battery w/ female brass terminals made using a military grade “pure lead” design. The pure lead allows the battery to be discharged and recharged completely to full strength over and over again up to 400 times. The PC545’s internal plates are more resistant to “sulfating” which is the major reason for battery failure. The PC545MJ Odyssey battery has 545 cranking amps and 185 cold cranking amps making it one of the most powerful starting batteries for its size. Odyssey batteries can be charged using a conventional battery charger or alternator at up to 15.2 volts and 25 amps however we do recommend using the Odyssey Ultimizer chargers shown below. This makes the PC545MJ truly two batteries in one; deep cycle and high cranking starting battery. The PC545 and PC545MJ are identical batteries except for the MJ which stands for metal jacket which is needed for protection from heat and vibration. Be the first to review “Odyssey PC545MJ High Performance AGM Battery” Click here to cancel reply.